Cold Art (broadcast on Radio 4 on 12/04) is now on iplayer. The page includes clips and a gallery of images. The documentation of ephemeral artwork, works made to be transient, changeable and un-fixed, is often problematic for the intent and premise of creation as it aligns itself with a particular moment, place and viewpoint in time. Lens-based methods are mostly relied upon to communicate actuality and happening and to fix the un-fixed memory of the artwork, and this is part of that problem. Effectively, this type of documentary device works in opposition to the concept of the artwork, cementing into a fragmentary history when all it wants is to be fleeting in its temporality. The lens-made recording tends to generalise vision and, by extension, it does not fully communicate the experience of ‘being there’ and present. This is problematic for artwork whose very premise is to be transient and time-based, and for which direct experience is a priority. ‘Documents, Alternatives (#3)’ is an exhibition that includes time-based works that rely on performative process and created experience, which aims to resolve this issue by making the document and artwork reflexive. In doing this it acknowledges their need for change so that they remain continuous and in process through staging a practical and thought provoking visual discussion. The symposium accompanies this exhibition at BSAD, and acts in response to process with artistic practice and the experience of the artwork. It situates a series of opportunities for the experience of process through a structure of colloquialism adjacent to the exhibition, to open the nature of artistic process to critical debate. To enable a dialogue about process (as that exhibited and that discussed) informed by both academic and creative domains, symposium speakers are the artists with work in the accompanying exhibition. The opening of the exhibition follows the symposium, to which delegates are warmly invited. A taster of Teufelsberg, one of the sites visited in Cold Art. Recordings made by Freya Hellier, who produced Cold Art. Four artists one engineer and three days and two nights underground. Alan Smith, Louise K Wilson, John Bowers, Tim Shaw and Peter Mathews will enter Smallcleugh mine in Nenthead, Cumbria to settle into the vast cavern cut out of solid limestone by the lead miners; now known as the Ballroom. The Ballroom gets its name from an event that that took place on September the 2nd 1901 when around 30 local people travelled into the mine for a village dinner party and dance. The five will be faced with the challenge of not only existing in in this extreme environment for 72 hours, but will also be challenged to produce sufficient electricity for the production of works that will respond to the place through their overall experience. On the 3rd day licensed mine guides will bring an audience down to Ballroom to view the results and meet the artists. The GecStonesWilson website is now live (http://gecstoneswilson.org/). First public event to be announced soon..
March issue of Interalia Magazine now live online. Place and Space. Inside and Out explores the sense of place and space, both as an exterior phenomena (physical space) and as a source of internal personal transformation (altered mental space). I shall be showing a participatory work Timeline - originally made in collaboration with psychologist Professor Madeline Eacott as part of the forthcoming exhibition States of Mind: Tracing the edges of consciousness at the Wellcome Collection, London (February 4th - October 16th, 2016). An accompanying new audio work Memoriagraph (2016) will be developed during the run of the exhibition. "Following on from �States of Mind: Ann Veronica Janssens�, this changing exhibition will examine perspectives from artists, psychologists, philosophers and neuroscientists to interrogate our understanding of the conscious experience. Exploring phenomena such as somnambulism, synaesthesia, and disorders of memory and consciousness, the exhibition will examine ideas around the nature of consciousness, and in particular what can happen when our typical conscious experience is interrupted, damaged or undermined." "Three sound artists encourage a deliberate turning towards the broken and wasted, to gaze at it. They focus our sights via the ears. The mind quiets and sees the ruined landscape, the potential for destruction." I am interested in how language is acquired, acts of translation and the mistakes made audible when learning new songs by ear. The vehicle for this is Silent Night, Holy Night (written in Austria in 1818) � a Christmas carol that is on UNESCO�s national list of �Intangible Cultural Heritage� (formalising the idea that cultural heritage is transmitted from generation to generation in adaptable forms such as music, language and ritual). The song has acquired an enduring mythology � a hundred years ago it was reputedly sung by German and English troops in the brief and unofficial cessation of hostilities in World War One (the �Christmas Truce�). Polly, my daughter of five, learned the song at school and we sometimes sing it together at night in order to get her to sleep. In the recording she is singing into a �Groovy Tunes� plastic toy microphone containing a spring reverb-type mechanism. As such, this continues my interest in the simulation and archiving of different resonant acoustic spaces. This field recording was made in the attic of our home. 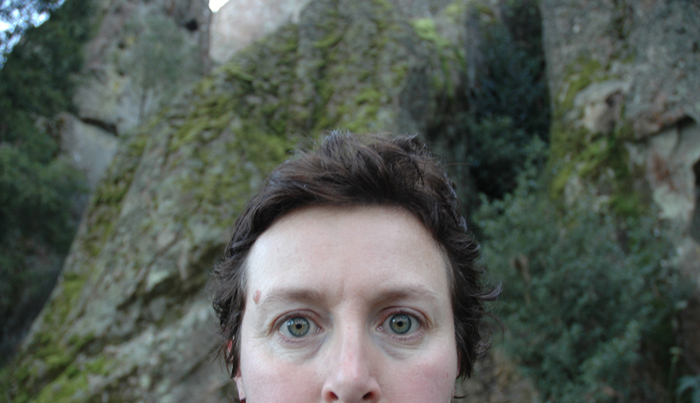 Louise K Wilson is a visual artist who makes installations, live works, sound works and single channel videos. Her current research uses the medium of sound to ask philosophical and material questions about the spatio-temporal physicality of certain sites and our perceptions of them. She has travelled to numerous (military and scientific) sites including nuclear submarines, US listening stations, university halls, marine research environments, rocket launch sites and disused RAF bases in pursuit of the acoustics of resonant spaces. Interview by Knut Remond with Louise K Wilson who implemented it on her own way for MC cassette 2 x 15 min. - Limited Edition (8 copies) - also hearable with headphone at the ohrenhoch archive potato. Mistaken Presence�s 12 month presence at Lincoln Greyfriars building draws to a end with A� Denouement. Drawing upon the activities that have taken place throughout the project, A� Denouement takes the form of an active archive displayed throughout the building, through the form of archive material, film, performances and texts. Together the archive point to fragments of the buildings history, whilst reflecting on the buildings current occupation as a contemporary art space. Finish / final drinks 4pm. The closing event will see the archive adapt and change throughout the day, as a number of performances bring the project to a close, Artist Marcia Farquhar leads a sermon-esq performance in a re-adaption of Mind Your heads which launched the commissions 12-months earlier, whilst artist Emma Smith will perform a new song composed for the building with Lincoln Choir group. Written by Smith and a team of local musicians, A Grea�t Stitheram is inspired by the building and its associated history�s to local Lincolnshire song. Louise K Wilson will give an introduction to the current Mistaken Presence project The Hours, for which she invited five people (from an open call) to spend 24 hours living in the Greyfriars Building. From 5am on Saturday September 29, 2012, they observed a modified monastic horarium (daily schedule) with specified times assigned for silence/ listening, sound recording, reading, discussion, sleeping and eating. Louise K Wilson will be �in conversation� with scientist Dr Alex Salam who assisted the development of The Hours project by supplying relevant readings and advice on design. He will discuss his studies into long duration space missions and life at remote research stations and thoughts on The Hours. Two of the participants from the Horarium will be present to answer questions on their experiences. There will be an opportunity for questions from the audience. Entrance is free and refreshments will be provided. There will also be an opportunity to hear the recently installed new audio work that uses recordings gathered from Greyfriars during the 'Horarium'. The Hours continues at Greyfriars until Oct 27th 2012. Opening Times: Thurs Sat 12-5pm. The Hours acknowledges the first incarnation of the Greyfriars Building, one of the earliest surviving Franciscan friary churches in Europe. This early 13th century building was originally part of a larger friary complex that included a kitchen, refectory and dormitory, spaces for worship and for living according to the horarium. The horarium (Latin, meaning �The Hours�), is the daily schedule of (monastic) religious communities where the day is divided into periods of time principally for prayer but also for work, study, meditation, recreation. The day was punctuated at regular marked intervals, prompting architectural theorist Sanford Kwinter to describe the monastery as a prototype clock. The Hours will take a number of forms commencing with a �laboratory� period of acoustic experimentation and data gathering in the space leading to a �closed� event where a small number of participants will spend a period of 24 hours sequestered in the chamber of the Friary abiding by a modified horarium. Louise K Wilson was invited to work on a new commission in parallel to the Topophobia exhibition at Spacex. The resulting work, Missing Scenes � An Evening at Hanging Rock, is based on Peter Weir�s iconic film Picnic at Hanging Rock. For the production of Missing Scenes the artist worked with three local people, who were invited to read the original novel by Joan Lindsay, in which a picnic that begins happily, ends in terror. Each reader was later interviewed by the artist about their recollections of the novel and their subsequent trains of thought. For Louise, it is a story that fascinates since, unusually, the mystery of the disappearances is never solved. She was interested in the idea of creating an ad hoc reading group who might individually arrive at differing theories and thoughts about this particular aspect. In the course of conducting the interviews, she was intrigued to discover how the process of reading the novel also sparked off a range of personal memories amongst the 'subjects'. Missing Scenes � An Evening at Hanging Rock will consist of Weir�s original 1975 feature film interrupted with video and sound interventions including extracts from the reading group interviews. It will be presented as a one off happening / performance event at the Exeter Phoenix cinema on 5 July. Artist Louise K Wilson was nominated by mima for the Institute of Contemporary Art's SOUNDWORKS project - an online platform and virtual exhibition space. For the project the ICA invited over one hundred artists, selected by the ICA and art institutions worldwide, to submit an audio work taking its stimulus from the themes evoked in Bruce Nauman�s seminal sound installation Days. "One hundred new sound works have been produced by artists from all over the world. Selected by our curators and art institutions worldwide, the artists have been invited to submit a sound file, taking its stimulus from themes evoked in Bruce Nauman's Days, presented concurrently in the lower gallery as part of our season on sound. SOUNDWORKS embraces the ephemeral nature of sound, and presents an online platform that doubles as a virtual exhibition space. This site aims to make the works internationally accessible, a place to explore the genre as a medium which is simultaneously inclusive, interactive, and subversive. It includes a wide range of audible approaches by artists who have been working with the medium for many years, as well as artists taking their first venture into the sonic arts." June's KOSMICA - the Microgravity Sessions will feature exclusively speakers who have floated in the air in zero gravity. We can guarantee that all participants have undergone at least 10 parabolas in a diving aircraft! Previously a resource solely available to trainee astronauts and scientists, pioneers Kitsou Dubois and Dragan Zivadinov opened the way in the 90s to artists flying in microgravity, and following a flight by The Arts Catalyst's curator Rob La Frenais with Zivadinov in 1999, over 50 artists and scientists flew in The Arts Catalyst's microgravity campaigns in Star City, Russia. Edward George and Anna Piva (Flow Motion) who composed soundworks recorded in Zero Gravity. KOSMICA is a free event, but space is limited so please book today. Examining works of contemporary art that have engaged with militarised landscapes, Matthew Flintham reflects on the ruination of outmoded military structures, the idea of landscape as an extension of the military imagination, and the investigative strategies of activist artists. Fear of place is the focus of this exhibition. Ten artists - Anne Eggebert, Matze Einhoff, David Ferrando Giraut, Polly Gould, Marja Helander, Uta Kogelsberger, Abigail Reynolds, Almut Rink, Emily Speed and Louise K Wilson - respond to this intriguing subject through drawing, video, painting, photography sculpture, sound and installation. As an anxiety disorder, topophobia is an irrational dread of certain places or situations. However, considered as a cultural phenomenon, the condition connects us to existential human questions of how we find our place in the world. The exhibition and accompanying publication take a look at the representation of place and space as both threatened and threatening. Why does the picturing of place provoke anxiety? The industrial revolution, and more recently information technology have increased the proliferation of images including those of place. TOPOPHOBIA reflects on the technologies of perception that shape our understanding of space and place, and presents a timely and essential enquiry into subjective responses to place in the 21st century. Artists in the exhibition consider basic rules of perspective, the significance of printed books and mapmaking, the influence of the camera, computer animation of simulated space, the wonder of Google earth and the possibility of recording sonic traces of an environment. TOPOPHOBIA is curated by Eggebert-and-Gould, and will tour to Spacex, Exeter 12 May � 7 July 2012. I am one of the five authors of the text 'The aerodrome�: Art, heritage and landscape at former RAF Coltishall which appears in the current Journal of Social Archaeology Volume 12 Issue 1 February 2012 pp. 110 - 132. English Heritage and others are often called upon to record historic aviation sites, along with a range of other comparable (in scale and complexity) former military and industrial places. Recording typically takes place once the site is abandoned and prior to its redevelopment. RAF Coltishall (Norfolk, UK) presented a rare opportunity to record the site while it remained in use, and to continue to record it during the period of drawdown and closure; to watch as things were packed away and as families left. This seemed too good an opportunity to miss, and to take full advantage English Heritage decided to share the task, gathering together a team of artists and archaeologists whose interests were focused on the types of material culture and methodological issues which Coltishall presented in abundance. In this article we describe the background to this project, the methodology we developed, and ultimately our various (and at times very different) responses to the site. TOPOPHOBIA examines the fear of place in contemporary art. Following an introduction by curators Eggebert-and-Gould, Dr Caterina Albano will open the afternoon with a discussion on the history and development of this anxiety disorder and its relationship to the modern urban context. Exhibiting artists Matthias Einhoff, David Ferrando Giraut, Polly Gould, Uta Kogelsberger, Emily Speed and Louise K Wilson, and writer Leslie Forbes, will each give a talk and come together to discuss their work in relation to the themes of TOPOPHOBIA. This symposium contributes to current debates on freedom and the culture of fear, and connects us to the existential human question of how each of us finds our place in the world. Entrance free. Booking essential. To reserve your place email Anne Eggebert at a.eggebert@csm.arts.ac.uk � please head your email TOPO SYMPOSIUM (you will need to bring a print out of your email booking confirmation to gain access to the building � please see www.csm.arts.ac.uk/sites for our new location). This event coincides with the TOPOPHOBIA touring exhibition at the Danielle Arnaud Gallery (until 19 February 2012). Please visit www.daniellearnaud.com for opening hours. The TOPOPHOBIA Symposium is a Central Saint Martins College of Art and Design Art: Public Realm research group event. A publication including colour plates of the artists� works, a short fiction by Leslie Forbes, essays by Dr Caterina Albano, Thomas D Trummer and Eggebert-and-Gould, accompanies the exhibition. The book is distributed by John Rule www.johnrule.co.uk . 11 am, Monday September 12th, 2011. Louise K Wilson and David Chapman will be taking part in this programme, talking about their work centred on the Falkland estate in Fife, sourcing and collecting historic sounds associated with this former royal hunting park. 'Hearing the Past' looks at how the latest research in acoustics is helping to recreate authentic sounds of the past. It brings together a diverse group of scientists, engineers, sound archivists, museum curators and sound artists. The producer is Jane Reck. �Hearing the Past� will be broadcast on BBC Radio 4 at 11 am on Monday September 12th. The programme is now available via the Radio 4 website http://www.bbc.co.uk/programmes/b014f9q5 . The programme has also been selected as BBC Radio 4�s Documentary of the Week. The catalogue for Light & Dark/Motion & Stasis at the 24/Seven Project Space, Gooden Gallery, London (April-June 2011) is now available via Blurb, the on-demand digital publication service. This exhibition included 'Pane' by Louise K Wilson and Spencer Roberts and was curated by Chris Meigh-Andrews. Louise will be presenting her work at the one day forum UNKNOWN FIELDS: From the ATOMIC to the COSMIC on July 11 (11 am - 4 pm). This event precedes the Unknown Fields Division's summer 2011 nomadic studio expedition to the Chernobyl Exclusion Zone, Ukraine and Baikonur Cosmodome in Kazakhstan. This Forum will be held at the Architectural Association, London. Louise K Wilson and Spencer Roberts are creating a new artwork entitled 'Pane' for 24/7, a project space at the Gooden Gallery in Vyner Street, London. The work will be installed on the afternoon of June 10 and will be viewable twenty-four hours a day from that evening until the morning of June 17 2011. This is one in a series of eight, week-long installations by different artists, curated by Chris Meigh-Andrews. The works are all based on themes relating to notions of contrast between basic states or conditions, such as still life & the moving image or motion and the static image or light and dark. David Chapman and Louise K Wilson will be presenting a paper Falkland: a sonic investigation of place at Keep an Ear On: 5th International FKL Symposium on Soundscape in Florence, Italy. A catalogue entitled Re-sounding Falkland has now been printed and will shortly be distributed. This publication explores the process behind the collaborative sound art project by David Chapman and Louise K Wilson which focused on the Falkland Estate (and Falkland Palace) in Fife, Scotland, and was realised in May 2010. It includes commissioned essays by David Jones, Christopher Woodward, Damien Murphy and Eric Laurier. It was designed by Joerg Hartmannsgruber. This will be a discussion event accompanying Tocsin Bang, a solo exhibition by Stephen Felmingham currently at East Street Arts: Union 105. While looking at the exhibition, the two artists and the audience will talk about themes such as the architecture/traces of the Cold War, the notion of the sublime, the importance of childhood memories and archives within artistic research, representation through specific media as well as the theoretical context of the works. Cinema met live music at this hybrid event mixing found footage with electric results. Experimental filmmakers Jenna Collins and Sam Meech presented two new kaleidoscopic short films, made during their Gleaners residencies in the North West Film Archive at Manchester Metropolitan University, with live soundtracks from cutting edge North West musicians. The screening also included Louise K Wilson's 'Euphony' and Jordan Baseman's 'Inside Man' - both artists made their films using NWFA collections.